The sun rose and September 11, 2001 began excitedly. I was running in the Democratic primary for City Council. Something I had dreamed of one day doing was unfolding. But by 9AM, my perfectly organized and well-funded campaign would no longer matter. An unexpected and incomprehensible murderous act of terror would spoil that sunny day. That morning, a retired police officer drove me around to polling places to greet supporters and voters. As we crossed the parking lot at the Concourse Village Co-op, a dazed looking woman walked by mumbling something about airplanes crashing into the World Trade Center. After confirming that something indeed had happened in Manhattan, we got back into the car and turned on the radio. Maybe it was a horrible accident, we thought. As we drove to the River Park Towers polling station, my driver called a friend at the police command center. As she told him what had happened, the most bloodcurdling shriek came over the phone as the South Tower crumbled before her eyes. At that moment, I felt a head-to-toe chill course through my body. It was a sound that I never want to hear again. It was gut wrenching, terror-filled and sorrowful. I felt ashamed that I was running for office at the same time hundreds of my fellow New Yorkers perished in the twinkling of an eye. I thought of the many police officers and firefighters I knew and met during the course of my life. And I prayed that none of them were killed or trapped in the rubble. Eventually, my friend and I parted ways. After leaving me at the campaign office, he made his way down to the World Trade Center to join the unending flow of first responders. I learned that Governor Pataki had issued an executive order canceling the city’s primary elections. Lunch was fed to campaign workers as they trickled in from the closed polling stations. It didn’t matter that my election plans had been dashed. Hundreds of my fellow New Yorkers had perished in the twinkling of an eye. As I gathered the campaign workers to discuss next steps, I asked my treasurer, who was an assistant pastor, to lead us in pray. There is comfort in group prayer when facing an incomprehensible tragedy. An abiding faith in God’s tender mercies enables us to better confront a dark malevolent unknown. I felt numb as I drove around the Bronx. I stopped at Democratic Party headquarters on Westchester Avenue where I saw other stunned and numbed people. We hugged, shook hands, and offered each other feeble words of encouragement. As I continued my trek across the borough, I drove past the mosques and masjids that dotted West African immigrant neighborhoods. I was pleased to see police officers standing guard. “This America, no one will be scapegoated for the acts of others,” I recall thinking proudly. During that day, I called family and friends to confirm that they were okay. I learned of a cousin who decided not to go into the World Trade Center that morning. So, it went for my immediate family, friends and me. We didn’t lose any loved ones. In the days that passed, neighborhoods across the city memorialized those killed on 9/11. Bodegas in listed the names of patrons who perished on that fateful day. While I couldn’t bring myself to visit Ground Zero, I donated blood at a nearby Pentecostal church. Since that September Sunday, I have continued to donate blood annually. When the rescheduled primary election was held two weeks later, I lost. That day, however, was a tremendous victory for democracy and the resiliency of New Yorkers. The attackers may have murdered our neighbors, killed our heroic first responders, and knocked down two iconic towers but they didn’t succeed in killing our civic spirit. For ten years, I kept an American flag visible on the dashboard of my car. It was my talisman and a reminder of the ideals to which I aspired. New York is the city of my birth and I love being an American. I love our optimism and our eternal hopes for the future. My opportunity to serve in public office came eighteen months later. President Obama has asked us to resurrect the unity of spirit and volunteerism that exemplified American exceptionalism following 9/11. He reminded us that a decade later Osama bin Laden is dead, we have Al-Qaeda on the run and the war in Afghanistan is coming to an end. The unity that defined America then, has run aground on the shoals of the Great Recession and presidential politics. I never gave up hope that bin Laden would be punished. I won’t give up on this country coming back stronger and more united from this recession. Neither should you. Nor should we ever forget the events of 9/11. This entry was posted in Uncategorized and tagged 9/11, al qaeda, first responders, Ground Zero, Osama bin Laden, President Obama, September 11, World Trade Center. Bookmark the permalink. 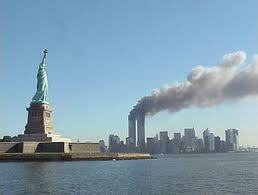 Today is the tenth anniversary of September 11th. I remember being woken by a call from my mother. In a panic she screamed, “We have been attacked!” We watched the second plane crash together. It was horrendous. We didn’t know anyone who died that day, being a native Texan, New York seems so far away, but it devastated my mother and I. My entire city was in ‘shock and disbelief’, companies in downtown Houston released employees from work and evacuated office buildings, I didn’t go to school that day. When I did return to class, I asked my teacher how she was doing, she started crying. It was days before I heard any laughter. I spent most of that time watching continuous news coverage, flipping the channel when the on-air personality began to irritate me. I was glad when SNL returned for their first show after the national tragedy. The country needed to hear a joke.